A rat killing station / feed station for airguns is an essential part of my toolkit for keeping down the rodent population in my yard. I live on almost a quarter acre lot in a lovely area in Northern California. The weather is mostly mild, and we have a long growing season. We have a bunch of fruit trees, and the neighbor feeds the squirrels, birds, possums, raccoons, skunks, and most unfortunately Rattus Rattus, aka the black rat, ship rat, roof rat, and house rat. Rattus Rattus is an import, and probably came over on sailing ships from Europe. These rats carry Bubonic Plague via rat fleas, and can pass on other rather nasty diseases, including: typhus, Weil’s disease, toxoplasmosis, trichinosis, Streptococcus pneumoniae, Corynebacterium kutsheri, Bacillus piliformis, Pasteurella pneumotropica, and Streptobacillus moniliformis, etc. I don’t want these rats in my house, or in my yard, and making my family and animals sick. And so I’ve made it my mission to keep that population down. I’ve used normal snap traps placed under my house, and outside the house to take out quite a few. But with the neighbors feeding them, and their yard being so overgrown with a perfect habitat of English Ivy and numerous trees, bushes and undergrowth, and the fact I have fruit trees, they are fat, healthy, and making babies like crazy. I’ve set up three feeding stations for the rats to turn my airgun hobby into an airgun rat hunting hobby and mission of elimination. 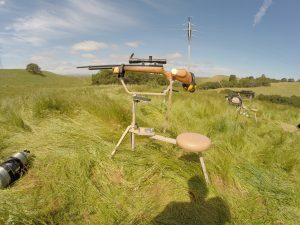 Some rat killing station, feeding and shooting with airgun considerations. I have to have a safe back drop. I can not shoot into my neighbor’s yard. 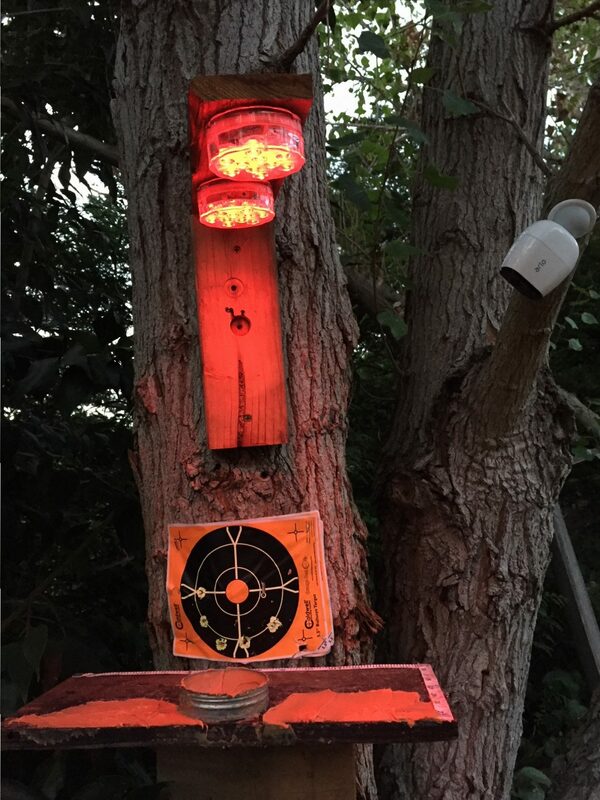 My current rat stations are mounted to trees, and the center of the target is smack dab in the middle of the tree. In front of all my current stations I have a wooden box of varying dimensions, that are filled with duct seal putty. In front of the putty I staple a 5″ square target I use to sight in the rifles. Before the evening, I’ll staple in a fresh new target, and if I’m shooting and miss, the target tells me where the pellet went. Often I’ll find the pellet hole in the target that has a curious bit of rodent hair stuck to the edges. This tells me the pellet passed through, and I’ll usually find the now dead rodent under the tree. The putty and the wooden box, and finally the tree insure that I’m not shooting into my neighbors yard. Safety first. I sight in my rifle carefully, and place any feeding stations so that a tree, wall or the feeding station itself, keeps me from shooting beyond my property. I put lead dust collectors, (LDCs) or moderators on my airguns so as to reduce the chance of disturbing any of my neighbors. One of my rifles, a Benjamin Marauder comes with a built in shroud that keeps this rifle incredibly quiet. My ears are worn out from playing drums for many years, and I can no longer tolerate loud banging noises. The Marauder fits the bill perfectly. The neighbors don’t know what I’m up to, and the rats tolerate my presence much more when I’m quiet. 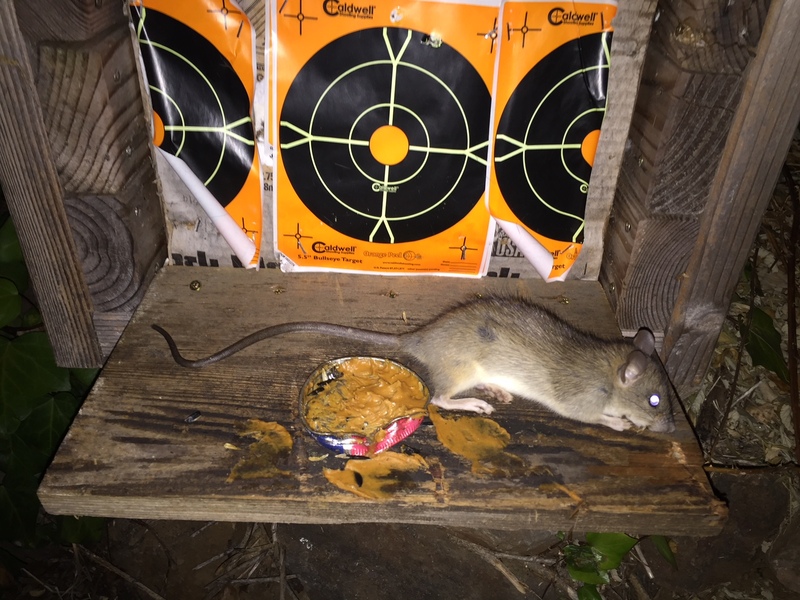 Even still, after shooting a rat with my airguns, it often shuts the feeding down for a minimum of 45 minutes, and often for the night. Be quiet, kill more rats is my motto. I’ve place Arlo Pro Surveillance cameras at the feeding / killing stations so I can see when the rats are active. I can manually check any camera from my computer or smart phone, and I get email notifications that a camera has detected motion. Use a Harbor Freight Ding Donger to Notify When Rats Are There. I usually wait until Harbor Freight has these on sale or in a coupon. $9.99 is the better price to pay. I now own four of these lovely ding dang dongers. Most of the rat activity has been at dark between 9pm and 5am (summer time). The rats are on to me though, and now most activity is after midnight and 4am. The rats will often make a drive by at the rat feed stations, running in, grabbing a morsel of peanut butter and skittering off to eat in a dark protected area. I bait the traps most often with peanut butter, though I have also had success using black oil sunflower seeds. I think fresh peanut butter is crucial, and they seem to appreciate the purest peanut butter. I see organic peanut butter on sale, and I buy several jars and store in a cool dark place to keep it as fresh as can be. I will also take fresh roasted peanuts and poke some in the peanut butter. The rats will often just sit and eat the peanut, and that’s when I take the shot. Black oil sunflower seeds work well also, though I feel more confident in the PB. I am now experimenting with offering the rats water, as we have been in a crazy 108 degree heat wave. So far I am having limited luck, as the heat appears to have completely shut down my feeding stations. Later on, when the rats and mice started moving around again, I noticed that they did drink up the water. During the day the squirrels enjoyed the water also. I have set up battery powered red L.E.D. lights above the feeding stations, and they work well most of the night to illuminate the Rodents so I can get a reasonable bead on their location. The key is to get the light bright enough for you to see the rats through a scope, but keep the light dim enough to not scare the rats away. 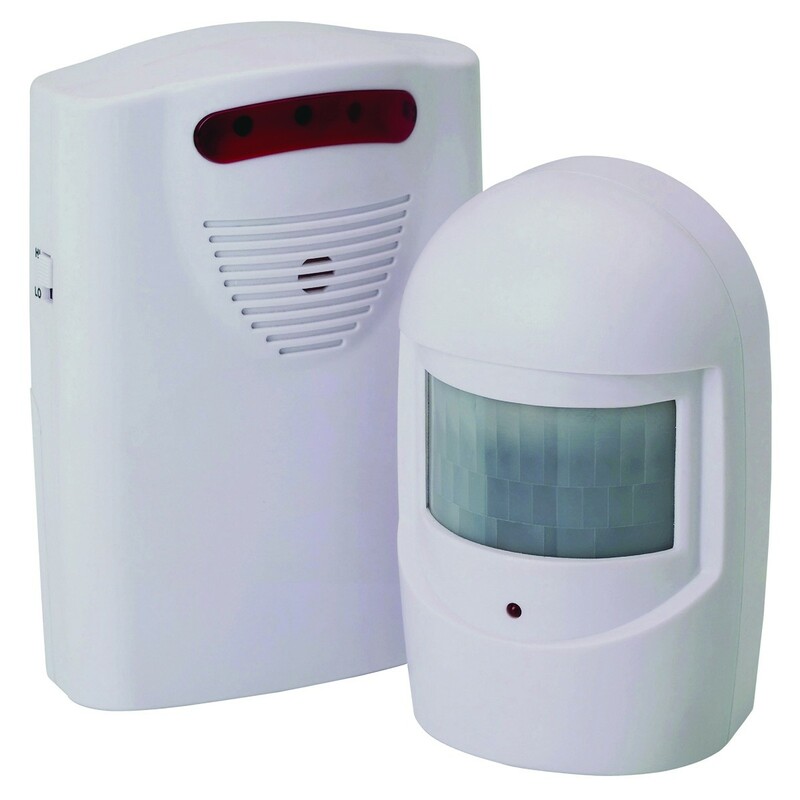 The LED’s I use are dimmable and you can even change the color all via a handy remote. I use a set like this with rechargeable AAA batteries. It works perfectly! Battery powered multi colored led lights for killing rats. A hot trick is to use the remote to turn the light down by 3-5 clicks. This way the lights last all night long on a single set of charged up batteries. 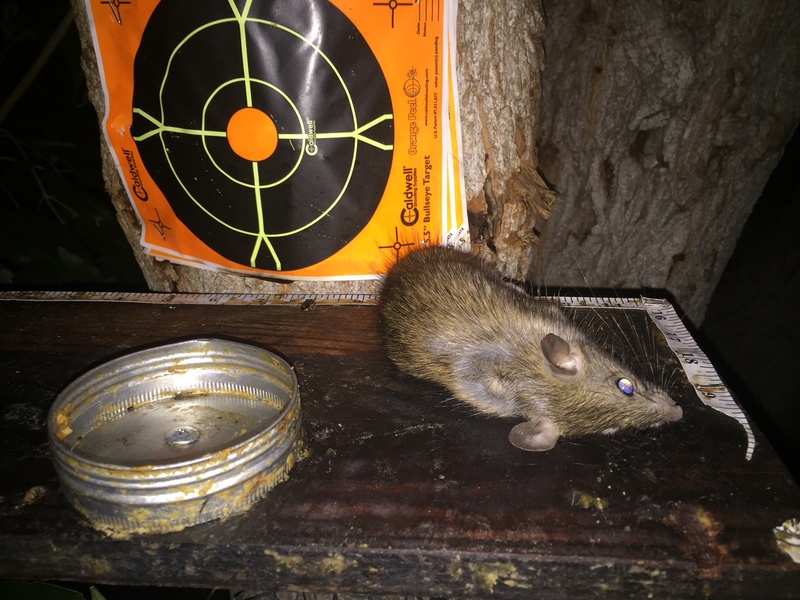 After a lot of trial and error I have found a comfortable rat killing or shooting distance with my airguns. Both rifles I typically use are capable of 1/2″ groups or smaller at 25 and 35 yards. I have on a regular basis shot small field mice at 35 yards and taken their heads clean off. A rat’s head is quite a bit larger and with either of my .25 rifles I seldom miss. My rifles are sighted in to 25 yards, and the point of aim is almost exactly the same at 35 yards. 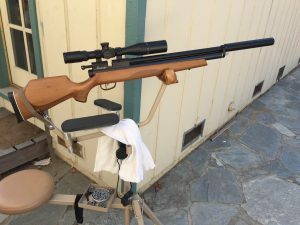 My current favorite airgun for rat hunting is my .25 Cal Eun Jin Sumatra Carbine. It’s overkill, but I love the ergonomics of it, and even with the power turned way down, if it connects with a rat, it is not usually going to get up. Video shows rats getting knocked back hard, sometimes just rolling over dead with x’s on their eyes. Other times they’ll roll off the feeding station and twitch or bounce around. They are dead though and this activity is the central nervous system shutting down. I don’t like to torture any live creature, and so my goal is to just put their lights out as painlessly as possible. All of the shots so far have been complete pass throughs. With the rifle making 46+ FPE on lower power, this makes sense. 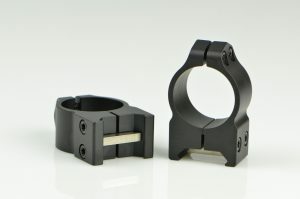 I have been using a UTG Leapers 3×12 compact scope with illuminated cross hairs. Most of the time though it’s overkill to turn the illumination on. And often it makes it harder to see my quarry. I just recently purchased a month old SWFA Super Sniper 10×42 scope. I seldom change magnification settings of any of my scopes, and I thought I’d try out one that was a fixed focal length, and eliminate a lot of extra features and complexities. This particular scope is quite a bit longer than the UTG Compact I normally use, but seems to be around the same weight. It came with Warne scope rings, which I think are perhaps a pain to set up, at least compared to the quick release UTG Rings I have on many of my airguns. The SWFA Super Sniper 10×42 scope is bright, and has good contrast. The reticle is SUPER FINE, and this can be a problem in the low light conditions I normally shoot in. I’m not sure I’ll keep this as the main scope for ratting. 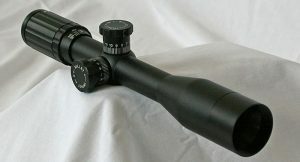 I also recently purchased a BSA TMD 4-14X44 FFP Hunting Riflescope. It is a First Focal Plane, Glass Mil Dot Reticle, and to me quite interesting. It is huge, and I’m currently testing on my new to me first generation Benjamin Marauder .25 tuned by Travis Whitney. Stay comfortable when rat killing with a shooting chair. 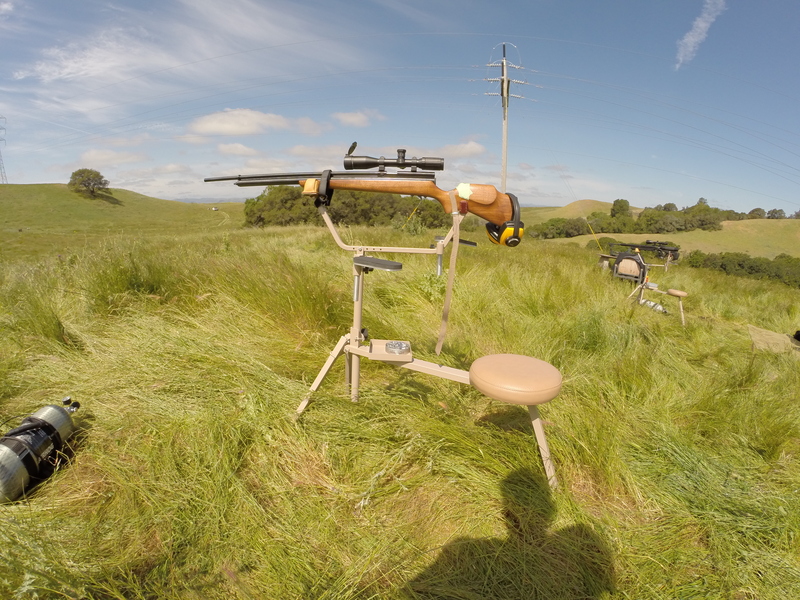 I have tried leaning against the house, using a tripod as an air rifle rest, resting on a sawhorse, and most recently on a Born Wild shooting chair. 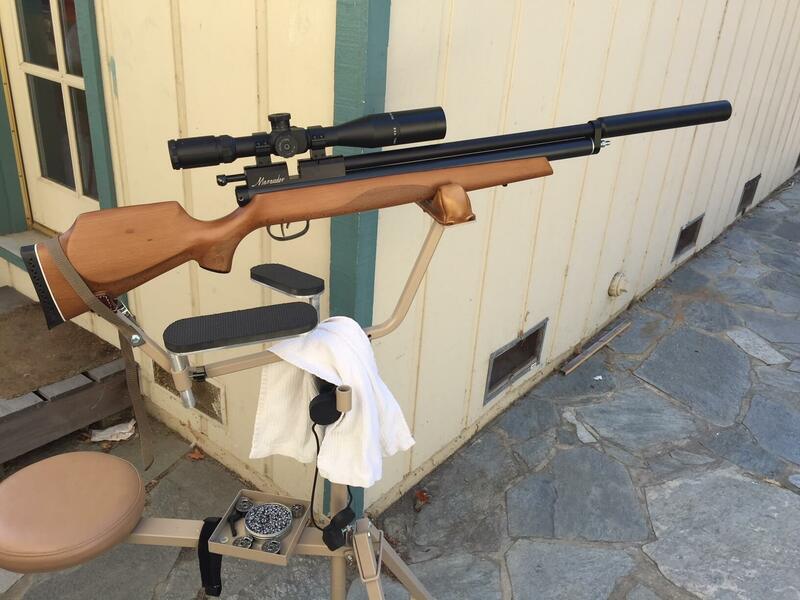 My buddy Kevin took an old design for a squirrel shooting chair, and worked and re-worked details to make it a super strong, comfortable, stable and portable shooting chair platform for plinkers, target shooters, and hunters alike. I am blown away by this amazing hunting chair. 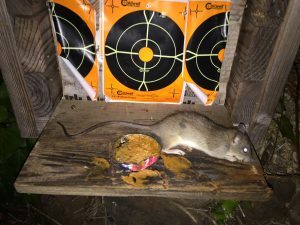 Some keywords: Air Rifle Pesting, Rat Shooting with Bait, Rat Killing Station for Airguns, Rat Feeding Station, Airgun Rat Pesting.